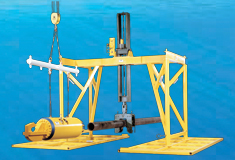 The Oil States Diverless Pipeline Recovery System is used for retrieving pipelines dropped during lay operations or in need of repair at the surface. The system uses a lift frame with ROV interface to lift the pipe while a pipe-recovery tool (PRT) is stabbed over the pipe end. The PRT is a modified grip and seal connector with a large hook on one end to facilitate pipe retrieval. The gripping collets of the PRT are actuated to hold the pipe. Once testing is completed via ROV, the frame is retrieved to the surface. The pipe can now be lifted to the surface by the hook on the PRT. This system is also available using a saddle and yoke configuration to retrieve the pipe and is based on customer-specific needs. Simple, reliable ROV interface design. Frames and pipe-recovery tool are retrievable and reusable. No special pipe prep is required except removing concrete weight coating. Proven grip and seal technology. Can also accommodate dry pipe lift requirements.